Wallpapering Fog: Football analyst network vis: New and improved! Football analyst network vis: New and improved! My original visualisation of the football analysis community on Twitter generated a fair bit of interest, so it's time for a new and improved version. I didn't know how to do that, or even that you could. But I do now. I've also extended the starting group of analysts to the 110 accounts on this list. If you're followed by at least two of those accounts, then you should appear in the network graph somewhere. Following loads of them doesn't count - they have to find you interesting too! Here's step one. You get a bigger node if more people in this community are following you. It's not sized by follower count in general, otherwise Barack Obama and Cristiano Ronaldo would have the biggest circles, by miles. More closely linked people will cluster closer together. And next (again via a tip from @balbezit), we can shade the communities in different colours. 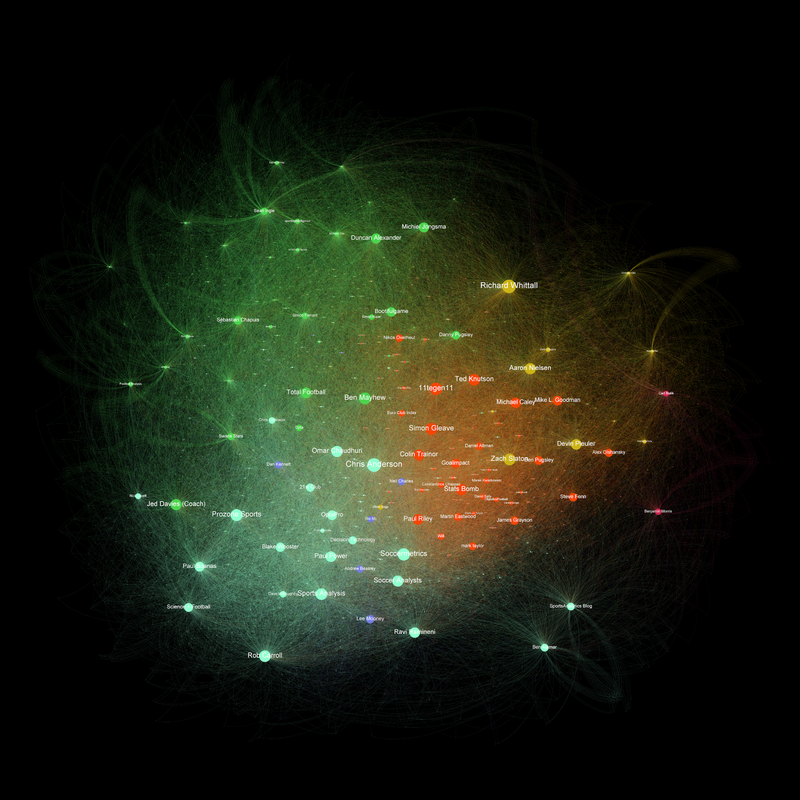 This is an automatic algorithm in Gephi and I think it's quite effectively separated everybody by their interests. It's a big web page. You will have to give it a while to load. If you use Internet Explorer then you deserve the issue that it will look blurry, rather than crisp and easy to read. Download a proper browser. Try clicking nodes and zooming and panning around the view! Help! I can't find my own account! 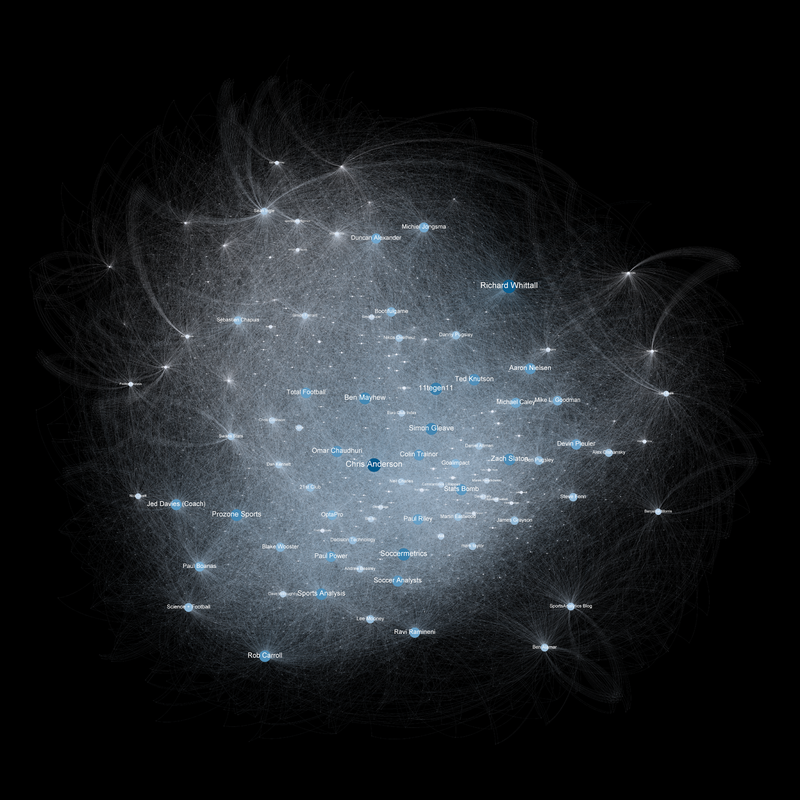 The chart will filter to show your personal following network, but your own node still might not be obvious, if it's small. Near the top of the bar that's popped up on the right hand side of the page, hover over your name. Voila! There you are. @balbezit for the tips, Gephi for a brilliant bit of visualisation software and to Scott Hale for his fantastic Sigma.js exporter that was used to build the interactive vis.